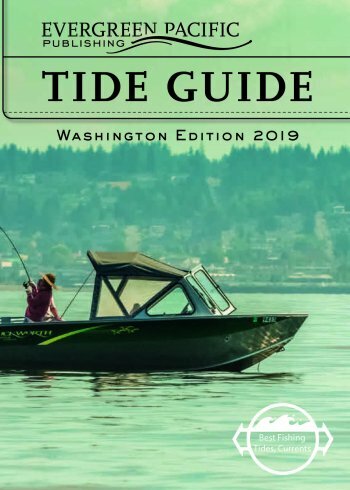 The most complete and most user-friendly pocket tide book for Washington waters, the Evergreen Pacific Tide Guide offers tides for Seattle, Port Townsend, Bellingham, Olympia, Aberdeen (for tides of the Pacific Beaches), Port Angeles, & Sekiu. All minus tides are listed in red, and the Seattle and Port Townsend tides include the popular visual tide graph calendars for each month. All tide & current tables list times in chronological order using an AM & PM clock (vs. 24 hour clock -- eg. 3:45 PM instead of 15:45).Also included are Deception Pass and Tacoma Narrows current tables, correction tables for over 120 locations, sunrise/sunset & moonrise/moonset tables, bridge clearances & signals, and recompression chambers for the Pacific Northwest. And for fishers, hunters, and animal trainers, lunar predictions for the Best Days & Times to Fish are given. Due to comprehensive content and easy-to-use format, this is definitely the best compact tide book available.